This article discusses the differences in special educational systems in Finland and Norway in relation to the PISA scores. By comparing the Finnish system with the Norwegian, we have found that the strong focus both on early intervention and on reading and writing in Finland have positive effects on this country's PISA results. The situation in Norway is different, where there is less use of early intervention and a markedly weaker emphasis on reading and writing within special education. We discuss these differences in relation to these countries’ different cultural orientations with respect to education in general and to special education in particular. In this article we shall explore the possible differences and similarities in special education between Finland and Norway in relation to these countries’ results in the Programme for International Student Assessment (PISA) investigation. By analyzing the accountability policies in Finland and the United States in relation to the PISA test, Itkonen and Jahnukainen (2007) have emphasized the differences in schooling culture and special education between these two countries. They argue that the use of special education within the Finnish school system was the reason for Finland's success (see also Sahlberg 2007). Kivirauma and Ruoho (2007) have also focused on the Finnish special educational system, especially the role of part-time special education, in explaining the successes of the Finnish school in the PISA test. The situation in Norway is quite different, at least according to the PISA results. Therefore, from a comparative special educational perspective, the differences between Finland and Norway are interesting and call for a careful investigation in order to see clearly if, and in which ways, special education can make a difference in schools for children with special needs. The aim of this article is, therefore, to highlight these differences and to discuss whether it can explain the differences in the PISA results between these two countries. Finland is overall the best performing country in the PISA investigation, and this position has remained unchanged since the first test in 2000. The Finnish results have been relatively stable over the years, and in the 2006 test Finland rated first in science, second in reading after Korea and second in mathematics after Taiwan (Table 1). The Norwegian picture is far less positive (Table 1). Norway has traditionally scored around the mean on the PISA test; however, in the latest test Norway was the only Nordic country to score below average in all subjects (Kjærnsli et al. 2007). In general the Norwegian results have decreased over the years compared to the other Nordic countries. Table 1. Differences between Finland and Norway in PISA 2006. Source: Kjærnsli et al. 2007. Another striking Finnish result is the extremely narrow standard deviation. As seen in Figure 1, the standard deviations in the Finnish results are clearly below OECD mean, and in general the Finnish standard deviation is among the lowest. When we relate the score to the standard deviation, the Finnish school system presents itself as not only the best school in the world, but also as the best school ‘for all’ in the world, that is, there are relatively small differences between the best and worst performances. Standard deviation of PISA 2006 results between Finland and Norway in relation to OECD-mean. The Norwegian standard deviation is much broader. As seen in Figure 1, Norway is over the OECD mean in both science and reading, and at the OECD mean in mathematics. Compared to the Finnish results, the Norwegian school displays a bigger gap between the high-performing and the low-performing students. Furthermore, the standard deviation in both countries reflects differences within schools, and not between schools, meaning that there are no systematic differences between the schools. These results are different from several other countries where there is a clear difference between high-performing and poor-performing schools (Kjærnsli et al. 2007). The lack of differences between schools in both Finland and Norway can be understood as an indication of the success of the Nordic welfare system, and in this light the Finnish school is more successful than the Norwegian (Hotulainen and Takala 2008; Kjærnsli et al. 2007; Kuusela 2002). Compared to the OECD mean, the socioeconomic background factors play a limited role in educational achievements in Finland and Norway; however, the Finnish school performs better again in the sense that these factors are even less important than in the Norwegian schools (Kjærnsli et al. 2007; Hotulainen and Takala 2008; Kuusela 2006). The distribution of performance in, for example, reading skills emphasizes the abilities of the Finnish school to achieve good results and to keep the number of students with weak performances quite low. The PISA test divides reading skills into six levels with level five as the highest performance. As seen in Table 2, Finland had 5% of students in the two weakest groups in the PISA 2006 study, whereas Norway had 22% in the same groups. Finland has managed to maintain its high level of performance over the years, but the number of poor-performing students in Norway has been increasing while there has been a clear decrease in high-performing students. Table 2. Comparison of reading skills from PISA on the number of students on the levels below 1, 1 and 5. Source: Kjærnsli et al. 2007; Kivirauma and Ruoho 2007 (with kind permission from Springer Science + Business Media: International Review of Education, Excellence through special education? Lessons from the Finnish School Reform, 53, 2007, 287, J. Kivirauma and K. Ruoho, Table 1). The comparison of the results in Table 2 and the standard deviations presented in Figure 1 strengthen the view that the Norwegian school system faces serious challenges in the area of reading skills. Kjærnsli et al. (2007) have emphasized this challenge through their statistical measurements of reading habits and performance in science and mathematics that clearly show that skilled readers perform better in these areas than weak readers. According to Kivirauma and Ruoho (2007), one of the secrets in the Finnish success has especially been the focus on early language abilities within Finnish special education. Vislie (2003) claims that Finland has the world record in the number of students receiving special education. The official statistics state that this number has gradually increased since 2003 (Statistics Finland 2008). The number of students receiving special education in Norway has also increased over recent years; however, as seen in Table 3, there is an enormous difference between Finland and Norway. It is necessary, however, to read statistical data on special education with caution because each country has its own way of defining special educational needs. Table 3. Distribution of students in special education during 2007–8. Source: Statistics Finland 2008; GSI Norway 2008. In Finland pupils who cannot benefit from normal education receive full-time special education (Basic Education Act 1998:628). Another form is part-time special education, which is given to 22% of all school-aged pupils. It requires neither an Individualized Educational Programme (IEP) nor the status as a special child. Of all pupils receiving part-time special education, 2% are in pre-school, 74% in primary school and 24% in secondary school (Statistics Finland 2008). Part-time special education is usually given during some period for few lessons a week, and it starts immediately when learning difficulties arise. The emphasis, then, is on early intervention, and it most frequently takes place during first and second grades. In Norway the statistics are made from the number of students with their own IEP in some or all school subjects. In other words, the number of IEPs is not used as an explicit measure of special education in Finland, but it is the statistical measure for special education in Norway. These differences in statistical measures result in a clear difference between Norway and Finland in the number of students receiving special education. The differences between these countries are also clearly expressed in other ways. Not only do Finland and Norway differ in the amount of students in special education, but they also clearly differ in the distribution of students according to classes (Figure 2). Number of students (%) in part-time special education. As seen in Figure 2, the number of students receiving special education in Norwegian schools has been increasing steadily over the school years. This is quite different from the Finnish school where the main emphasis is on the primary school and even on the pre-school, which is not compulsory. An important difference here between Finland and Norway is the clear drop in the amount of special education given in the Finnish upper secondary school. However, the support in Finland is most frequent during the first and second grades, then it drops. It rises again slightly during the first and second years of secondary school, but there is a clear rise during the last part of secondary school (see Kuusela, Hautamäki, and Jahnukainen 1996). Success in PISA through special education? Figure 2 clearly illustrates the Finnish tradition of an early-intervention practice in special education. Half of the used resources are spent in primary school, and in addition the Finnish special educational system is also clearly intervening in pre-school. Early intervention is not regulated by law in Finland, but this strategy is seen as best practice and has long been part of the Finnish special educational culture, and is part of the new national strategy on special education (Kivirauma and Ruoho 2007; Strategy of Special Education 2007). In opposition to the Finnish practice, the cultural tradition of special educational interventions in Norwegian schools is for schools to try to avoid them, and special education is not at all seen as best practice. There is clearly a cultural difference between Finland and Norway with respect to implementing special education, and reasons for this are both ideological and practical. Policy-makers in Norway have, however, taken notice of the Finnish practice of early intervention, and this practice is now being presented as a goal for Norwegian special education in policy documents (e.g. St. meld. nr. 16, 2006–7). In Finnish formal education, mother tongue and mathematics have been a core target and held an instrumental position during the entire history of public basic education […]. Based on this historically determined emphasis on language and, later on (especially in the 1970s) the increased psychological understanding of the role of language in the development of mental abilities, the spoken and written language has ‘inherited’ its key role in special education implemented within the basic education system as well […]. The strong emphasis in special education for learning languages and mathematics can be one explanation for the Finnish results in the PISA test. In the Finnish primary stage, the emphasis on special education is on reading and writing, covering 53% of the whole support. If we include challenges in mathematics and speech, 90% of primary special education is covered. At the secondary stage, however, the main emphasis is on mathematics, and then on foreign languages, which together cover 64% of special educational support. Many students are receiving extra help in these areas in the Finnish school, and the PISA data shows very good reading skills and small differences between the students. If the connection between language and the mental capacity in general is central as presented by Kivirauma and Ruoho (2007), then this factor would also explain the Finnish success in science. Kjærnsli et al. (2007) have found evidence of a strong connection between reading habits and the PISA results in science and mathematics, and the Finnish system of early intervention in reading, writing and mathematics in special education takes advantage of this connection (Figure 3). The transparency of the Finnish language, moreover, seems to promote reading in comparison to some other orthographically more deep languages, like English (Seymour, Aro, and Erskine 2003). It should also be added that the PISA test and the Finnish special education both focus on the same academic areas, and so it seems plausible that the special educational system in this country plays a positive role in relation to the PISA test. With respect to the distribution of special education in Norway, the connection between these academic areas and the use of special education is not very strong (Figure 3). Focus on areas within part time special education in Finland and Norway. Note: Data on the distribution of special education according to problems is however not accessible at a national level in Norway. The data used in Figure 3 is therefore gathered form a survey investigation performed by Nordahl and Sunnevåg (2007) containing 2038 students defined as having learning problems. According to these researchers the data presented represents a normal picture of the situation for special education in Norway. Source: Statistics Finland 2008; Nordahl and Sunnevåg 2007. The difference between these countries in the emphasis on language and speech in special education is even clearer if we look at the area of ‘other problems’ in Figure 3. Speech problems represent about half of the Finnish data in this area, and this help is given in the early stage of the school years. In addition, problems with foreign languages represent 23.2% of special educational help represented in this category. In other words, the special educational system in Finland address especially well language-related problems. The situation is very different in Norway. Speech problems comprise a relatively small area in Norwegian special education. There is also no general tradition in Norway for giving special education to students who have problems with a foreign language. In Norway, the category of other problems contains a broad spectrum of people with mental disabilities (e.g. Down's syndrome, Asperger's syndrome etc. ), and physical disabilities (e.g. blind, deaf, cerebral palsy, etc.). A very interesting difference between Finland and Norway is the number of students with behavioural problems. 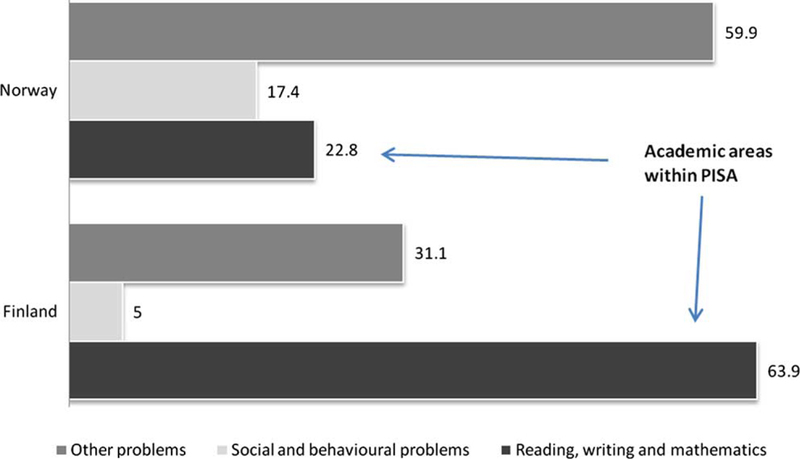 As seen in Figure 3, there are many more students with behavioural problems in the Norwegian school. One reason for this can be the Finnish special educational system reduces the cause for behavioural problems with its strong focus on speech, reading and writing. These factors can be the actual reason for behavioural problems at a later stage in the student's school career; hence, it could be that a side effect of speech and language training is a reduced amount of behavioural problems (Törmänen, Takala, and Sajaniemi 2008; Miller, Hynd, and Miller 2005). The PISA results as part of the comparison of Finland and Norway appear to show that the special educational system in Finland does offer superior systematic help that increases the academic standards of their students. One specific example can be the Norwegian PISA score in reading where the score is quite low and the standard deviation is very high compared to Finland. There are, however, at least two problems with this comparison. First, statistical and conceptual problems arise when we compare the special educational system of these two countries. As already described, the statistical measures of special education are quite different between Finland and Norway. The description used by Statistics Finland (2008) on what counts as special education would not be looked at as special education in a Norwegian context, but instead as a measurement of extra support or help in normal teaching. Giving extra support and help is quite normal in the Norwegian school, but the statistical measurements of special education do not account for them. All the same, in light of the PISA results, it is reasonable to say that the extra support given in the Norwegian school is not sufficient compared to the support given in Finnish schools. The support teaching given in the same class or by the subject teacher varies a great deal in Finland, and no systematic statistics are available. Kuusela (2006) points out that support teaching varies according to gender and location, and is not always given to those most in need. However, special education and support teaching together form the basis for the good results of those who have challenges in learning. The second problem lies in the understanding of excellence when describing differences between school systems. As pointed out by Kivirauma and Ruoho (2007), the understanding of academic excellence as a measurement of results in clearly defined subjects can be challenged by the international goal of creating an inclusive school (e.g. UNESCO 1994). This area is particularly interesting in the comparison of the Finnish and Norwegian school because, as already shown, the Finnish school system has an extensive use of full-time special education in segregated settings (Kivirauma, Klemelä, and Rinne 2006) as well as an extensive use of part-time special education. In light of the goal for full inclusion, this segregated system is quite problematic, and not a sign of excellence (Gallagher 2001). According to Haug (2003), one of several important aims for inclusion is that it must lead to greater benefit for all children in schools; all students should have an education that enables them to learn and participate. In the context of this article this point is central. All students should participate and learn. There are both social and academic challenges involved in the goal of inclusion that are important in the comparison of Finland and Norway. According to Kivirauma and Ruoho (2007), an important area of the Finnish understanding of inclusion is the right to learn. This right is solved in two different ways. One way is by placing students in full-time special education. The other solution is part-time special education that is an integrated solution for guaranteeing the right to learn for every student. Part-time special education plays, therefore, an important part in the Finnish strategy towards inclusion (Takala, Pirttimaa, and Törmänen 2009). To ensure a fluent, efficient homogeny in the Finnish school, the purpose of both the full-time and the part-time special educational system is to reduce the number of students with special needs. As pointed out by Kivirauma, Klemelä and Rinne (2006) and Brantlinger (1997, 2001), this system has a clear link to a general social marginalization because the full-time special educational system has a statistical overrepresentation of immigrants, students with single mothers and students from the working class. The Norwegian school has for the last 40 years emphasized integration and inclusion as important goals for schooling (Haug 1999). Hence, the Norwegian compulsory school makes very little use of full-time special education, and offers this support mainly to students with severe mental disabilities and to students with severe social and behavioural problems. The reduction of full-time special education in Norway has its basis on humanistic ideas and research on academic results in segregated and inclusive environments (Markussen et al. 2007). Several studies show that the academic results seem to be better in inclusive environment in comparison to segregated environment (Freeman and Alkin 2000; Myklebust 2006; Stangvik 1970), and children with special needs who have attended normal classes have easier access to further studies (Markussen 2004). The Norwegian school, therefore, regards the link between academic standards and social acceptance as very critical. The criticism towards full-time special education is also partly transferred to the part-time system in Norway, and there is much research that criticises the way special education marginalizes and excludes students, even if the support given is part-time (e.g. Nordahl 2000). The humanistic ideas found in the Norwegian school and the criticisms seen in research have also influenced the political level in Norway, and a few years ago there was a serious discussion about a juridical change in the educational legislation to end the right to special education in Norway because of its tendencies to exclude and marginalize students (NOU 2003). The proposed alternative to special education in Norway is to place a greater emphasis on ‘individual education’, meaning that the teacher has the obligation to give each student adapted teaching according to the general curriculum. The new strategy of special education, published in December 2007 in Finland, has expressed a similar demand (Strategy of Special Education 2007). The emphasis on ‘individual education’ has a clear goal of reducing the amount of special education given in Norway (Berg and Ness 2007), and again this move must be seen as an example of the criticism of the special educational system. Individual education will be offered by the normal class teacher, and this clearly emphasizes another aspect of the Norwegian understanding of the role of special education. In a Norwegian context, special education takes the form of extra educational support that is given when the normal education fails to give sufficient educational support (Persson 2007). In other words, special education is a kind of first aid to normal education. If we use the same reference to understand the role of Finnish special education, this would mean that the normal education given in Finland has some serious shortcomings, if 30% of the students need extra support from special education to create success. Nevertheless, the academic level in Finnish schools seems to be successful. It seems plausible that the Finnish special educational system offers a systematic help that can at least partly explain this country's PISA success. However, if this system were to be transferred into the Norwegian educational system, it is not clear how it could be done. Both academic results and social acceptance are very challenging for the school in both Finland and Norway, but the ways these challenges are met differ quite extensively. Even though Finland and Norway are geographically and culturally very close, it is unclear if there is a political or academic climate in Norway for implementing at a large scale the Finnish special educational system – especially not the extensive use of full-time special education. Compared to Finland, the anti-segregation movement has been very strong in Norway both within research in special education and in the political climate from the mid-1970s (Haug 1999; Hausstätter and Takala 2008). We believe that in a Norwegian context, there would be no political or social acceptance for a system that segregates about 8% of the students from the normal compulsory school – at least not today. The part-time system is, however, as a possible solution in a Norwegian context if it is part of a strengthened focus on an increase in qualitative education (e.g. NOU 2009:18). How Finnish or Norwegian special education will develop is not at all obvious, but the description presented in this article emphasizes that the special educational system clearly relates to national policy-making and that international comparisons can shed new light on the connection between national traditions and global trends in education. Basic Education Act 1998 : 628 . Suomen perusopetuslaki [Finnish educational law] . Berg , G.D. and Nes , K. (2007). . Kompetanse for tilpasset opplæring [Competence for individual teaching]. , [city: Oslo]: : Utdanningsdirektoratet. .
Brantlinger , E. (1997). . Using ideology: Cases of non recognition of the politics of research and practice in special education. . Review of Educational Research , 67((4)): : 425.–. Brantlinger , E. (2001). . Poverty, class, and disability: A historical, social, and political perspective. . Focus on Exceptional Children , 33((7)): : 1.–. Freeman , S.F.N. and Alkin , M.C. (2000). . Academic and social attainments of children with mental retardation in general education and special education settings. . Remedial and Special Education , 21((1)): : 3.–. Gallagher , D.J. (2001). . Neutrality as a moral standpoint, conceptual confusion and the full inclusion debate. . Disability and Society , 16((5)): : 637.–. GSI Norway . 2008 . http://www.wis.no/gsi/ (accessed August 18, 2008) . Haug , P. (1999). . Spesialundervisning i grunnskulen. Grunnlag, utvikling og innhald [Special education in the primary school. Basis, development, and content]. , [city: Oslo]: : Abstrakt forlag. .
Haug , P. 2003 . Qualifying teachers for the school for all . In Developing inclusive teacher education , K. Nes , M. Strømstad , and T. Booth , 97 – 115 . [city: New York] : Routledge . Hausstätter , R.S. and Takala , M. (2008). . The core of special teacher education: A comparison of Finland and Norway. . European Journal of Special Needs Education , 23((2)): : 121.–. Hotulainen , R. , and M. Takala . 2008 . Helsingin erityisopetuksen laatua arvioimassa [Evaluating the quality of special education in Helsinki]. Helsingin kaupungin opetusviraston julkaisuja A1. Helsinki: Edita Prima Oy . Itkonen , T. and Jahnukainen , M. (2007). . An analysis of accountability policies in Finland and the United States. . International Journal of Disability, Development and Education , 54((1)): : 5.–. Kivirauma , J. , Klemelä , K. and Rinne , R. (2006). . Segregation, integration, inclusion – the ideology and reality in Finland. . European Journal of Special Needs Education , 21((2)): : 117.–. Kivirauma , J. and Ruho , K. (2007). . Excellence through special education? Lessons from the Finnish school reform. . International Review of Education , 53((3)): : 283.–. Kjærnsli , M. , Lie , S. , Olsen , R.V. and Roe , A. (2007). . Tid for tunge løft. , [city: Oslo]: : Universitetsforlaget. .
Kuusela , J. (2002). . Helsingin kaupungin oppimistulokset, kokoava katsaus. , [city: Helsinki]: : Opetushallitus. .
Kuusela , J. 2006 . Thematic views into grading pupils in mandatory schools. Evaluating educational reseach 6 [Temaattisia näkökulmia perusopetuksen arviointiin. Oppimistulosten arviointi 6]. Opetushallitus . [city: Helsinki] : Yliopistopaino . http://www.oph.fi/info/Temaattinen_tasa_arvo.pdf (accessed April 18, 2008) . Kuusela , J. , Hautamäki , J. and Jahnukainen , M. (1996). . “Mitä, milloin ja kenelle? Erityisopetuksen virrat ja oppilaat [What, when and for whom? The streams and pupils of special education]. ”. In Erityisopetuksen tila [The status of special education]. , Edited by: Blom , H. , Laukkanen , R. , Lindström , A. , Saresma , U. and Virtanen , P. : 137.–. [city: Helsinki]: : Evaluation 2/96. National Board on Education. University Press. .
Markussen , E. (2004). . Special education: Does it help? A study of special education in Norwegian upper secondary schools. . European Journal of Special Needs Education , 19((1)): : 33.–. Markussen , E. , M. Strømstad , T.C. Carlsen , R.S. Hausstätter , and T. Nordahl . 2007 . Inkluderende spesialundervisning. Om utfordringer innenfor spesialundervisningen i 2007. Rapport nr 1 fra prosjektet: Gjennomgang av spesialundervisningen, Evaluering av Kunnskapsløftet . Utdanningsdirektoratet Rapport 19/2007. Oslo: NOVA . Miller , C.J. , Hynd , G.W. and Miller , S.R. (2005). . Children with dyslexia: Not necessarily at risk for elevated internalizing symptoms. . Reading and Writing: An Interdisciplinary Journal , 18((5)): : 425.–. Myklebust , J.O. (2006). . Class placement and competence attainment among students with special educational needs. . British Journal of Special Education , 33((2)): : 76.–. Nordahl , T. 2000 . En skole – to verdener . Et teoretisk og empirisk arbeid om problematferd og mistilpasning i et elev- og lærerperspektiv [One school, two worlds: A theoretical and empirical Work on problematic behaviours from a teacher's and a pupil's perspective]. Oslo: Avhandling til dr. polit.-graden ved Pedagogisk forskningsinstitutt, Universitetet i Oslo . Nordahl , T. and Sunnevåg , A.-K. (2008). . Spesialundervisning i grunnskolen – stor avstand mellom idealer og realiteter [Special education in schools – obvious differences between ideas and reality]. , [city: Hamar], , Norway: : Høgskolen i Hedmark. .
Persson , B. (2007). . Elevers olikheter och specialpedagogisk kunskap. , [city: Stockholm]: : Liber. .
Sahlberg , P. (2007). . Education policies for raising student learning: The Finnish approach. . Journal of Education Policy , 22((2)): : 147.–. Seymour , P. , Aro , M. and Erskine , J. (2003). . Foundation literacy acquisition in European orthographies. . British Journal of Psychology , 94: : 143.–. St. meld. nr 16 . 2006–7 . … og ingen sto igjen. Tidlig innsats for livslang læring [No left behind. Early intervention for lifelong learning] . [city: Oslo] : Norwegian Ministry of Education . Stangvik , G. (1970). . Effekter av spesialundervisning. En kritisk oversikt og et eget empirisk bidrag [Effects of special teaching: A critical description and an empirical contribution]. , [city: Göteborg], , Sweden: : Lärarhögskolan i Göteborg. Pedagogiska institutionen. .
Statistics Finland . 2008 . http://www.stat.fi/til/erop/index_en.html (accessed March 4, 2008) . Strategy of Special Education . 2007 . Ministry of Education. Report 2007: 47 . [city: Helsinki] : University Press . http://www.minedu.fi/export/sites/default/OPM/Julkaisut/2007/liitteet/tr47.pdf?lang=fi (accessed August 29, 2008) . Takala , M. , Pirttimaa , R. and Törmänen , M. (2009). . Inclusion in special education – The role of special education teachers in Finland. . British Journal of Special Education , 36((3)): : 162.–. Törmänen , M.K. , Takala , M. and Sajaniemi , N. (2008). . Learning disabilities and the auditory and visual matching computer program. . Support for Learning , 23((2)): : 80.–. UNESCO . 1994 . Salamanca statement . http://portal.unesco.org/education/ (accessed March 4, 2008) .